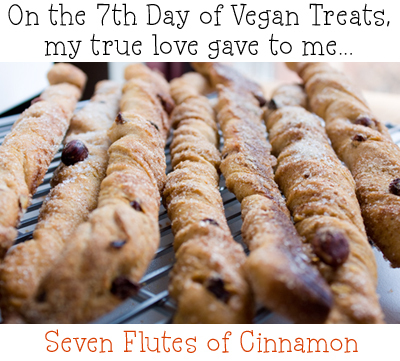 Seven Flutes of Cinnamon: 7th Day of Vegan Treats. Flute Inspired. 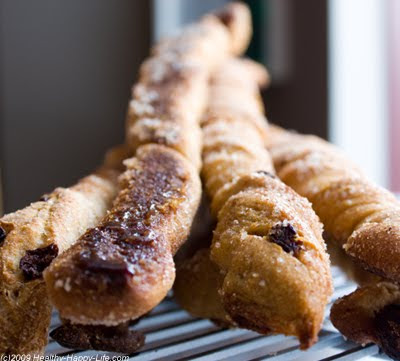 One of my favorite coffee-side treats is the hazelnut flute you can buy at Le Pain Quotidien. 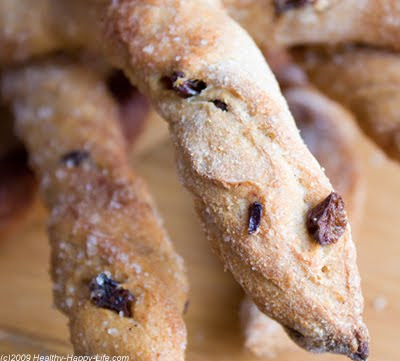 It's chewy, nutty, mildly sweet from the dried fruits and elegantly long-stemmed in a flute shape. Thick hearty grains fill the inside flesh. I love it. But sometimes I crave a homemade treat. 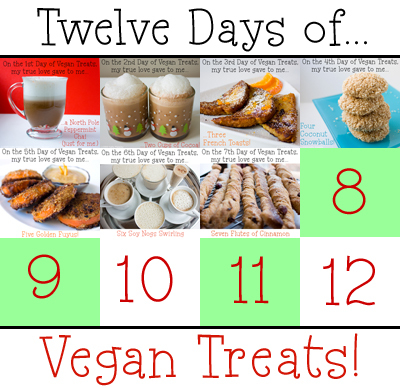 Thus, I took a hint from my fave long-stemmed munchie and tried out my own holiday-themed bread flute recipe. 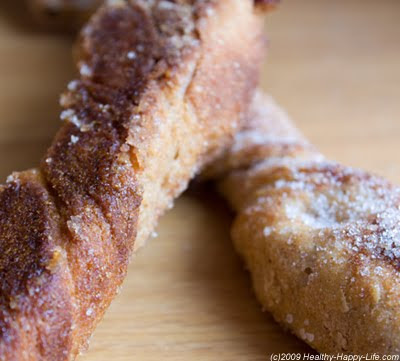 Cinnamon and Sugar Sticks. 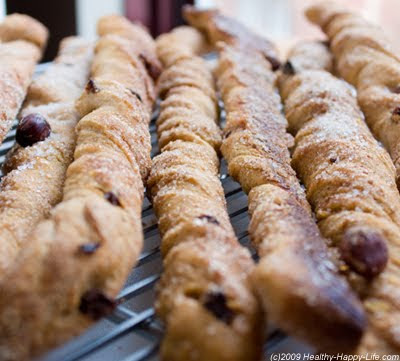 This recipe makes a nice big batch of cinnamon sugar flavored, whole wheat bread flutes. These flutes are the perfect winter-time accompaniment to your fave hot beverage. 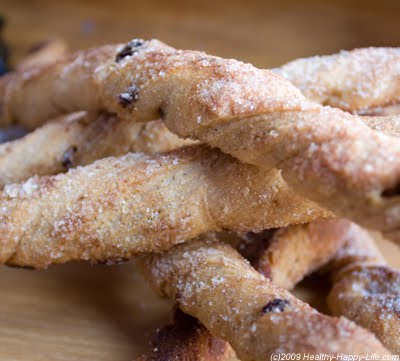 Call them a 'healthier version' of a cinnamon bun, churro or 'morning bun' pastry. Snow Day? Great for Kids. Plus this a fun recipe to make with kids. 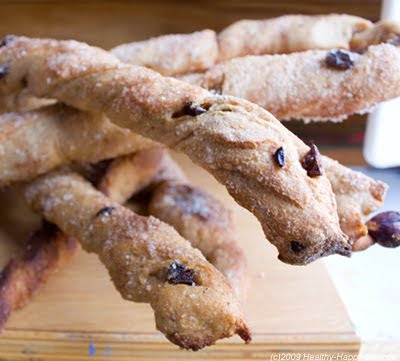 They will love kneading the dough and sprinkling the cinnamon sugar on top. They can even squeeze-roll out their own flute in any long shape they'd like. They will love improvising their own creative shapes like spirals, knots, snails, pretzels and even spelling out the letters in their name - then eating them. 1. First, activate the dry yeast by combining the yeast with 1 cup warm water in a large bowl. Stir briskly with the tips of your fingers. 2. 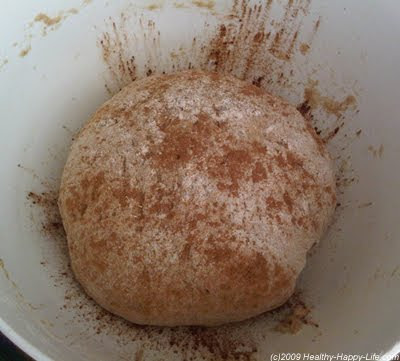 In a separate large bowl, sift together the flour, baking soda, salt, cinnamon and sugar. And in a side medium bowl, combine the topping ingredients: sugar, salt and spices. Set the medium bowl aside for later. 3. Next, soften the coconut oil in a 1/2 cup of warm-hot tap water. If using canola oil, obviously no need to 'soften' the oil. Fyi, the remaining 1/2 cup of warm water in the ingredients can be set aside to use as needed later. 4. Now stir the water and oil mixture into the large yeast bowl, and then begin adding in the dry ingredients (flour, sugar, baking powder, salt and spices). Keep adding until you have a nice lumpy mound of dough. If the dough seems too dry, simply add in the remaining amount of water little by little until a wetter dough consistency is reached. You want the dough to stick together, but also not be too sticky. 5. When your dough is well prepped, plop it onto a floured surface and begin kneading it. Knead the dough for 2-5 minutes. Roll it into a nice ball and plop it back into your large mixing bowl. I like to gently oil the inside of my bowl for easy removal of dough. I also doused a bit of cinnamon on top. Cover the bowl with a clean towel and place in a high or warm place for 30 minutes to rise. 6. After 30 minutes, punch out the dough with your fist. Transfer back to your floured surface, knead for a few minutes again. This time, you can knead in any nuts, fruit or other add-ins you would like in your flutes. Lastly, roll out the dough to a 1/2" thick flat layer. Grab your buttery spread and a pastry brush-lightly brush the entire surface of the dough. 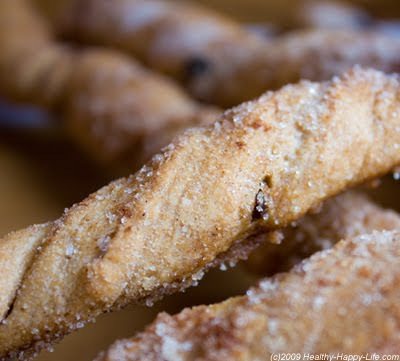 Next, slice the dough into strips. Each strip will be a flute. You can also slice each flute in half if you want shorter flutes. 7. Next, begin forming your flutes. I wanted 'twisted flutes'. So I twisted each long strip into a spiral. I then dropped each spiral into the cinnamon sugar mixture (medium bowl I had set aside). I covered the flutes (all sides) in cinna-sugar, then I placed them on my greased baking sheet. You can do any 'shape' you'd like. But flutes are perfect for dipping. 8. Repeat until all your dough is used and placed on a baking sheet. Cover dough with a light paper towel and let the dough rise for another 15-20 minutes. 9. Next, bake the dough at 400 degrees for 18 minutes, or until the edges of the flutes become brown and crisp. Note: You can even do another light brush of buttery spread midway through the cooking time, as add a few more dashes of cinna-sugar, if you'd like. 10. Remove from oven to cool. 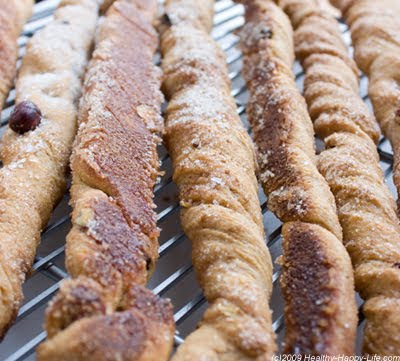 You can also do another dousing of cinnamon-sugar while the bread flutes are still warm. I like to add a light pinch of coarse sea salt to the flutes before serving. Store in the freezer and left thaw for 30-50 minutes at room temperature before serving. You can also re-warm in the oven after thawing.